MINNEAPOLIS, MN--(Marketwired - Oct 1, 2015) - This year marks Caribou Coffee's twentieth year of supporting breast cancer in honor of their original Roastmaster, Amy Erickson, who lost her battle with cancer in 1995 at the age of 33. 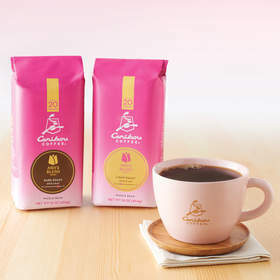 The premium coffeehouse is commemorating their longstanding commitment with the return of Amy's Blend and continued support for CancerCare® by giving away twenty $1,000 ultimate coffee break grants honoring caregivers across the country. Caregivers across the country are encouraged to enter to win a $1,000 grant to cover anything from travel expenses to a day of pampering in recognition of their ongoing efforts. To enter, caregivers can share their personal caregiving tip on Facebook, Instagram or Twitter using the hashtags #20WaystoCare and #contest, and tagging @CaribouCoffee. Twenty participants will randomly be selected throughout October to win a $1,000 ultimate coffee break grant. Visit CaribouCoffee.com/amysblend for more information and details on how to enter. "We continue to be inspired by Amy's kindness and care for others as we enter our 20th year of supporting this cause," said Michele Vig, SVP of Marketing and Product. "Over the past 20 years, Caribou Coffee has given approximately $2.5 million to cancer non-profit organizations through Amy's Blend. This year we are paying special tribute to caregivers across the country and the important role they play in helping those battling cancer by giving away the ultimate Caribou coffee break." Amy was known for infusing her passion for life into every blend she developed and every batch of coffee she roasted. She was critical in establishing Caribou Coffee's original roasting style and standards, many of which the brand still follows today. Amy's Blend, created in her honor for the past twenty years, is a vibrant and sweet blend, combining citrus and melon flavors with a smooth, silky finish. This year, Caribou Coffee will also be releasing Amy's Blend Dark Roast coffee. Ten percent of all Amy's Blend coffee and merchandise will continue to support CancerCare®, a national nonprofit organization committed to helping people cope with cancer through counseling, support groups, education and financial assistance*. "Amy was an incredible sister, daughter and friend. Throughout her battle with cancer I was one of the caregivers to provide the support she needed. Not always an easy role to play, I found myself cherishing a few moments each day to regroup so I was at my best for her," says Lisa McInerney, Amy Erickson's sister and caregiver. "I am thrilled that Caribou Coffee is not only continuing their partnership with cancer non-profit organizations but will also be honoring tireless caregivers." Caribou Coffee's Amy's Blend and Amy's Blend Dark Roast will be available at Caribou coffeehouses across the country throughout October. Bags of whole bean and ground coffee will also be available in store and online. Visit Caribou Coffee on Facebook, Twitter or Instagram for more details. Sign up for Caribou Coffee's loyalty program, Caribou Perks, at www.CaribouPerks.com and download the new mobile app at any app store. * Minimum donation: $100,000. Maximum donation: $250,000. Founded in 1992, Caribou Coffee is the second largest company-operated premium coffeehouse in the United States with more than 272* company owned stores and 131* domestic license locations in 18* states and 209* international franchise stores in 10* countries. Caribou Coffee provides high quality, handcrafted beverages and food options to fuel life's adventures, both big and small. Known for a commitment to sustainability, the Company was the first major U.S. coffeehouse to serve 100% Rainforest Alliance Certified™ coffees and espresso. Caribou Coffee products can also be found in grocery stores, mass retailers, club stores, foodservice providers, hotels, entertainment venues and online. To learn more about Caribou Coffee, visit website, Facebook, Twitter or Instagram. Sign up for Caribou Coffee's loyalty program, Caribou Perks, on the Caribou Coffee mobile app at any app store.